Migrants in Central Park, The Warblers Are Coming! Who: Adults, Children able to be quieter. Why Responsible: There is a constant battle between those who would keep certain park sections habitat rich, "wild" & species appropriate and those who would "clean" wooded areas. Warbler tourists give reason to preserve habitat for the endangered species. Income and support for local guides. Each spring thousands of foreigners migrate across our borders from Cuba, South America, and even Mexico. Under cover of darkness, they make their way north to Manhattan’s Central Park. By the first months of the new year, their epic journey begins. Navigating by the stars, sun, and the earth’s magnetic pull, they travel thousands of miles from their southern winter homes en route to breeding grounds as far north as the Arctic. It is a perilous and exhausting pilgrimage. The route, once lush with forests and open meadows, is largely changed now, nature has been replaced by pavement and brick. And each little traveler, most less than a half-ounce (14 grams) of flying fury, must also compete for air space with the huge, powerful, uncompromising, engine-driven metal birds. They arrive at last, in waves of different species and colors, to the oasis in Manhattan’s heart: Central Park. Here they rest, refuel, and then without a trace, are gone again. Who are these stealthy visitors? They are warblers and other tiny birds, each obeying an ancient pull. WARBLERS COME IN AN AMAZING ARRAY OF COLORS LIKE THIS BLACK THROATED BLUE (WINTERS IN PANAMA, COSTA RICA, CUBA, ETC) CAPTURED BY ROBERT WALLACE IN CENTRAL PARK. The feathered migrants arrive under cover of darkness - at least they hope to. New York City’s famous night-lit skyline can be deadly. It is estimated that fatal light attraction kills over 90,000 of the intrepid wayfarers each year. But thanks to New York’s nature respecting government and business leaders, many of our most iconic structures including the Time-Warner, the Chrysler, Rockefeller Center, and all city government buildings, have opted to turn down the light during prime arrival times (April 1 to June 1). New York is truly a sanctuary state. Most of the feathered transients spend only a few days or at best couple of weeks, then, one night, they are gone again, headed north, to breeding grounds as far as the Arctic. Advice from Elise Boeger, "The peak for the spring migration is the last week in April and first two weeks of May." If you want to see these colorful visitors, you must be here at exactly the right time. And hundreds of two-legged guests from all over the world do just that. For the second year in a row, Gerald Griffiths, president of Avian Adventures, based outside of London, is bringing one such international warbler-loving group to New York. 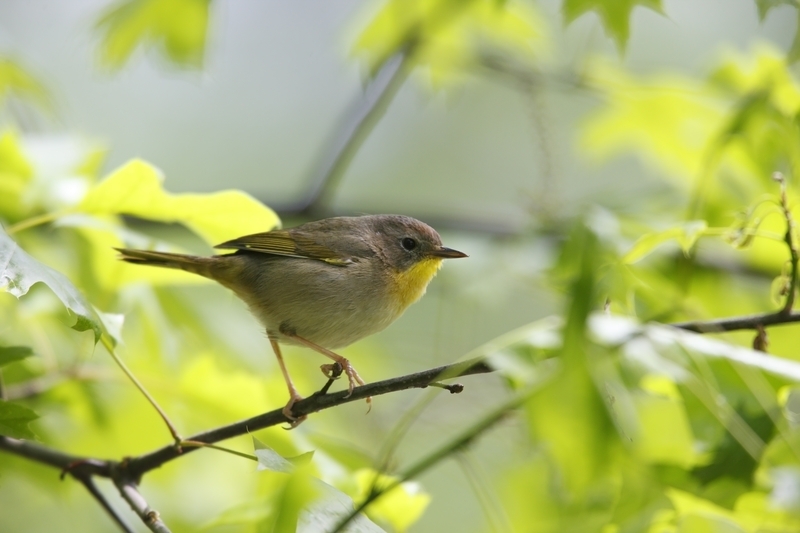 CENTRAL PARK FAN, GERRY GRIFFITHS OF UK BASED AVIAN ADVENTURES, FOLLOWS THE WARBLERS UP THE HUDSON RIVER VALLEY. IMAGE: AVIAN ADVENTURES. Gerry and his clients have been exploring the world’s most beautiful natural environments for over 25 years. I asked him why they come to Manhattan, a city of brick caverns and 8 million people, to see warblers? Gerry said, "...the amazing variety and volume of birdlife present amidst a hive of human activity and in a major world city (that draws us here). I have not experienced anything that compares with New York’s Central Park. "The amazing Park allows the opportunity to experience close encounters with a fantastic variety of American wood warblers (Parulidae) – one of my favorite bird families. It also allows one the opportunity to enjoy New York’s wonderful array of star attractions. I just love New York City." We do too. Gerry! Good friend, avid birdwatcher and guide, Elise Boeger shared her favorite warbler spotting place: The Ramble. EXPERIENCED BIRDWATCHER, ELISE BOEGER, SHARES THE SECRETS FOR SPOTTING THE TINY JEWEL-LIKE WARBLERS IN CENTRAL PARK, NEW YORK. "My favorite area in Central Park is the Ramble. Frederick Law Olmsted, Designer of the Park, considered these 36 acres his 'Wild Garden' — a tranquil escape from urban life. "The meandering paths through beautiful trees, and gardens, rocky outcrops, streams and a lake, are meant to slow folks down, and (give them time to) appreciate just how inspiring nature can be in our bustling city throughout the year. "While early morning and late afternoon can find these birds most active, during peak days all day can be very good. And mid-day is a good time to look along the streams and pond areas of the Ramble as well." Says Elise, "Among my favorite warblers are the ones I first saw decades ago, magnificent blackburnian, hooded. black & white, blue wing, and Cape May warblers … in the Ramble. Over the years, all become favorites! While we have 'wave days', where we can get 20 + species of warblers, there are so many other beautiful migrants, and a few stay to breed in the Park." Elise continues, "Overall, I have seen 37 warbler species just in the Ramble. While some birders come to Central Park to see these species for the first time, many birders love the challenge of finding these birds every year. We call this the FOY, or First of Year sightings. And the challenge is also to identify them with their beautiful songs, especially the ones who mostly forage high in the canopy of trees." The Ramble's thirty-eight acres (15 hectares) of thicket, the Gill a (man-made) stream, the Azalea Pond, rocks, trees, and shrubs is a favorite for the migrating warblers and other neotropical birds — and a great place to begin your warbler adventure. But the park is spread over 843 acres (341 hectares)! Be sure to save time to explore the Park’s other wonderful and completely different areas too! Another beautiful and productive birding area in Central Park is the North Woods, again a more serene area, consisting also of gardens, ponds, and the Great Hill. First Time Birders are Always Welcome! 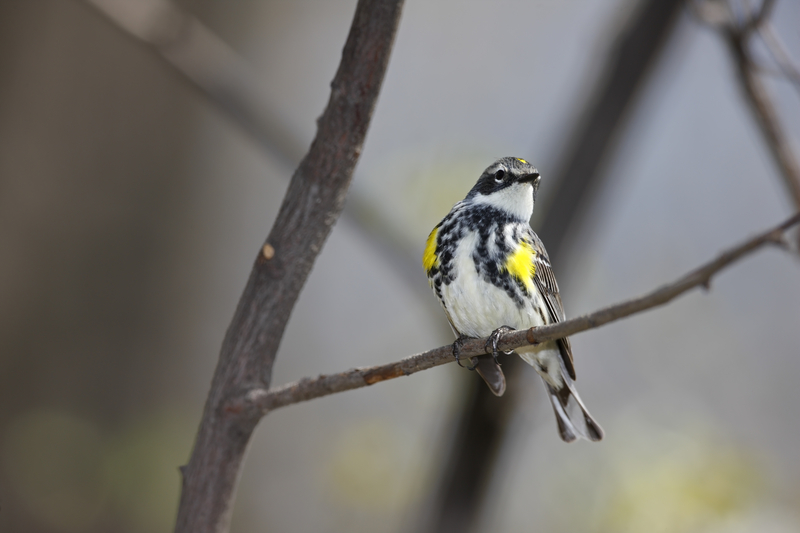 While the Ramble and other areas of the Park can be good most of the year for birding, many folks come for the annual spring and fall migrations of the beautiful Eastern wood warblers, and other magnificent song birds, or Neotropical Migrants. Tanagers, thrushes, vireos, swallows, orioles, and our birds native to NYC, bring birders from all over the world….as well as from the NYC region and other states. Many groups lead birding tours, including the American Museum of Natural History, NYC Audubon, the Linnaean Society, and the Central Park Conservancy. During the warbler migration, there may be hundreds of avid birders, standing in clumps of 2 to 50, all looking up. Hint: robins, sparrows, starlings are easily spotted on the ground, but warblers mostly stay high in the trees. When you see a “clump” of people stop. Look up. Ask someone what they are looking at. New York bird watchers are never happier than when they are introducing a new watcher to their favorite hobby. Avid Birder or First Timer - Seeing the warblers is fun with a guide who knows all their secrets! 2) Follow the Migrants up the Hudson River Valley: Adults Only: Join Avian Adventures' Gerry Griffiths and Elise for 10 days as they begin in Central Park, Jamaica Bay, and follow the tiny migrants up the Hudson River Valley as far as Fort Edward, New York. Stay in quaint inns, enjoy fresh local meals. We have 5 spots left! May 10 - 19, 2017 No previous birding experience necessary. On the agenda: Nature, warblers & other song birds, nesting great blue herons, and nesting bald eagles, local inns, delicious fresh local food, and great company. For more information contact us here. Put: “I Want to See the Warblers!” in the heading. New to Birding? Borrow a Bird Watching Kit! 1. Be Considerate of Others. Asking questions of the birders is fine and welcomed. Pushing, bumping, loud voices and other noises are not. They disturb both wildlife and the watchers. 2. Avoid flushing or otherwise purposely disturbing wildlife. Never try to “Flush out” birds by getting close, moving or disturbing bushes or trees. 3. Keep dogs away from bird sighting areas and never allow them off leash. 4. NEVER purposely chase wildlife! 7. Know and observe the laws, rules, and regulations governing the site. Some warbler and other birds species are threatened or endangered. Flushing or bothering them is illegal. Birds: Along with the warblers, Central Park is also home or resting place for over 200 avian species including numerous types of woodpecker, four owl species, and numerous songbirds. For an amateur (like me), the water birds are easily to find, graceful, and beautiful. Two of my favorite places to spot white egrets, sometimes a great blue heron, and colorful duck species are from a comfortable sitting spot on the rocks at the edge of the Turtle Pond (lots of red-eared slider turtles here) or during a walk around the Jackie Kennedy Onassis Reservoir. But it is the raptors - or perhaps a single raptor that is most synonymous with Central Park. The most famous, beloved, and sometimes controversial single bird in Central Park, New York, and maybe in the entire world must be Pale Male, the red tailed hawk. A couple of springs ago, I watched him (some say this hawk is really one of Pale Male’s adult offspring) coax his three youngsters from a pine tree with offerings of dead rodents. Neither he nor the hawklings were the least bit nervous of the crown that circled no more than 20 feet from where they eventually landed. We all watched for hours, taking pictures, quietly debating Pale Male’s parenting techniques, and making bets as to which of the youngsters would grab the gift first. These are truly city hawks. It was wonderful. Coming to Manhattan for the weekend? Leave your car at home. This is a walking city. Take a bus into Port Authority or the train, both Amtrak and New Jersey Transit into Penn Station. Or take Metro North and arrive in Grand Central Station. Once in Manhattan, the second best transportation, after your own feet, is the subway. Get a day ticket, or a per-trip multi-ride deal (since I tend to misplace them, I usually stick with no more than a $20 renewable card). Connect inside Penn Station to the uptown C-subway (blue line) and get off at West 86th Street. Cross the street and you are in the park. Or at Grand Central transfer inside to an uptown 4, 5, or 6, (green line) train, get off at 72nd, or 77th, or 86th Street. Walk west three blocks and again you are in the park. There are free subway maps available at the kiosks in the stations. The subway lines are color coded and easy to follow. Remember, “Avenues” run north and south, “Streets” run east and west with the numbers going higher as they go uptown. The dividing line for East / West streets is Central Park or 5th Avenue below 56th Street where the park begins. Never be hesitant to ask anyone on the street for directions. New Yorkers love their city, we are delighted to help you find you way anywhere in it. But be ready! They will probably suggest six more of their own favorite “don’t-miss” secret favorites. MORE Birding in New York State! Tell us. Like it. Share it. Comment! Tell us what your favorite bird or bird adventure is below or here.